It fuels the journeys of shorebirds along the Eastern Seaboard and feeds some loggerhead sea turtles and sharks. The horseshoe crab is intricately woven into the web of life. Yet this harmless and primitive sea creature not only plays a key role in nature, it occupies a crucial place in the human world as well. Over three decades ago, medicine claimed this ancient animal as a new life-saving tool. In 1971 researchers discovered that when they exposed the horseshoe crab to E. coli bacteria, the crab’s blood clotted. The clotting indicated the presence of endotoxins, toxic substances released by E. coli and other gram-negative bacteria that could produce severe symptoms in exposed humans such as fever or hemorrhagic stroke. The simplicity of its immune system is actually what makes the crab’s blood useful to our biomedical industry. Horseshoe crabs live under the constant threat of infection in a habitat that can easily contain billions of bacteria per milliliter. To fight off infection, the horseshoe crab has a compound in its blood — LAL, or Limulus Amebocyte Lysate — which immediately binds and clots around fungi, viruses, and bacterial endotoxins. LAL’s endotoxin binding and clotting ability is what makes it so invaluable to our own pharmaceutical industry. Once the LAL test was recognized by the Food and Drug Administration (FDA) as an alternative to then current methods of testing for endotoxins, the pharmaceutical industry tapped in. Horseshoe crabs were abundant, their blood easy to harvest and the test took only one hour. Today, LAL has become the worldwide standard screening test for bacterial contamination. Every drug certified by the FDA must be tested using LAL, as do surgical implants such as pacemakers and prosthetic devices. 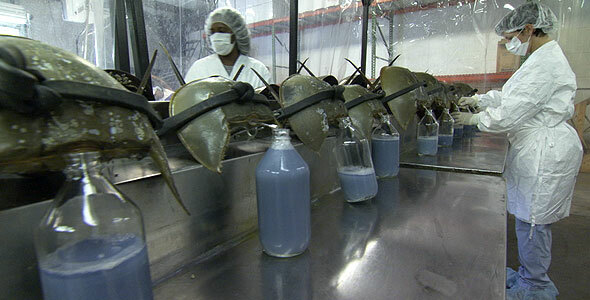 Horseshoe crab blood has not only become a key weapon in our medical arsenal, it has also become big business. On the world market, a quart of horseshoe crab blood has a price tag of an estimated $15,000, leading to overall revenues from the LAL industry estimated at U.S. $50 million per year. But that pales in comparison to its value to the pharmaceutical industry. Of course, to obtain LAL you need horseshoe crabs — and lots of them. According to the Atlantic States Marine Fisheries Commission, that $50 million dollar industry requires the blood of approximately 250,000 horseshoe crabs. While the blood of a horseshoe crab can be extracted without killing the animal, there is some question of how harmful bleeding is to the animals. The LAL industry says the bleeding causes no long-term injury. Adult horseshoe crabs are collected by trawlers and transported to the LAL lab, where they are washed to remove sand and other marine debris from their exoskeletons. Those crabs without visible injuries are placed on a rack and bled with a large-gauge needle. Up to 30% of the crab’s blood is removed. Within 72 hours, the bled horseshoe crabs are returned to the water, where their blood volume rebounds in about a week. LAL manufacturers have measured mortality rates of less then 3%. Yet two recent studies estimate that between 10% and 15% of crabs do not survive the bleeding procedure, which accounts for the mortality of 20,000 to 37,500 horseshoe crabs per year. Another concern is that it takes the crab a few months to rebuild its blood cell count level back up after a bleeding. Horseshoe crabs could be bled up to three or four times a year, which would take a toll on the health of the animals. But LAL manufacturers claim they only bleed them once a year. Whether we can or will protect the health of horseshoe crabs for their own benefit, for the good of other creatures, or for our own use remains to be seen. Despite supporting the fishing industry for over 100 years, the condition of horseshoe crab populations has largely been ignored by fishery managers until recently. With growing concern over declining populations, regulations on the harvest of Horseshoe Crabs have just recently been imposed, though some states are already loosening restrictions. Perhaps science can step in and “give back” to the animal for all of the good it has done us. Researchers are focusing their attention on producing LAL without the horseshoe crab, exploring the potential to cultivate and produce LAL from other sources.